Last night’s room reveals were a fairly disappointing bunch (a bit of a theme this season it would seem!) with some moments of genius scattered throughout. I was surprised by how underwhelming most of them were to be honest but I also appreciate that filling such large spaces wouldn’t have been easy. 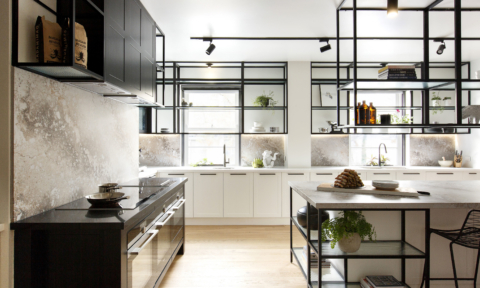 These rooms are some of the largest ever on The Block and the judges found plenty to love so here goes! 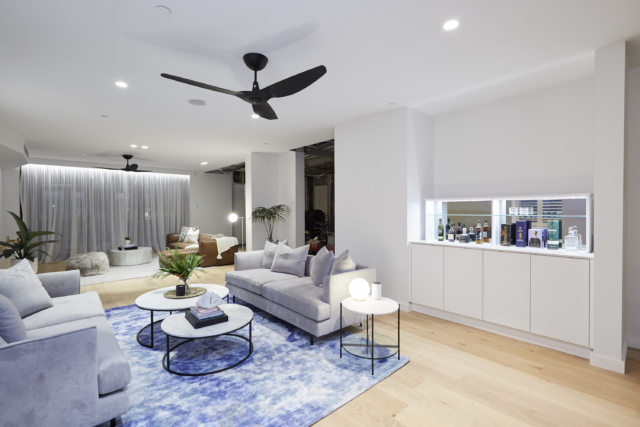 “Oh my God this room just goes on forever!” said Shaynna of Courtney and Hans’ living room that is the largest living and dining space in The Block history. 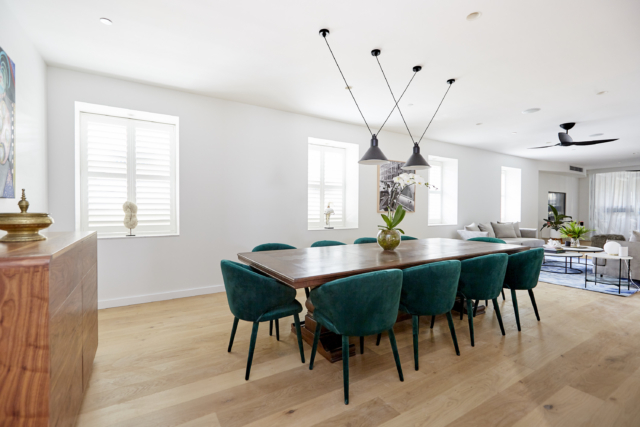 The bespoke dining table impressed the judges – particularly the walnut parquetry paired with emerald velvet covered chairs. 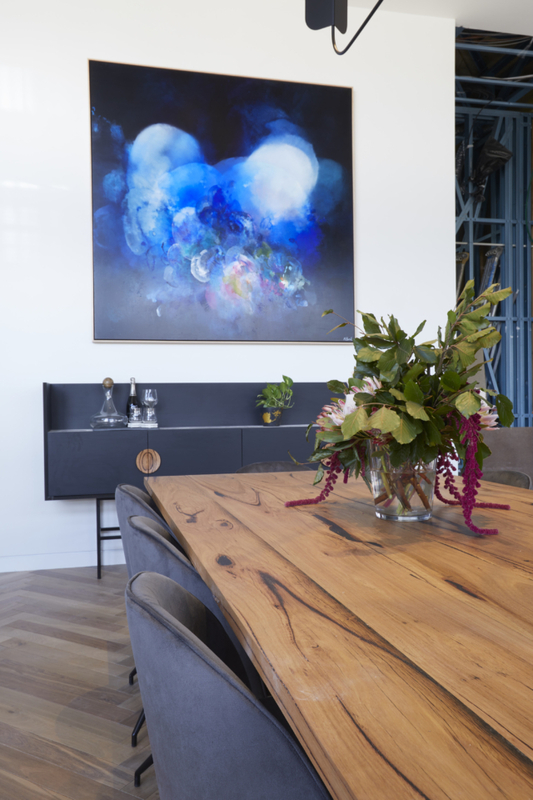 “It could be old, stuffy and too heritage but you pair this beautiful parquetry top with green velvet chairs and the whole thing gets elevated to something cool, contemporary and kind of edgy,” said Darren who found the table was his favourite thing about the reveal. 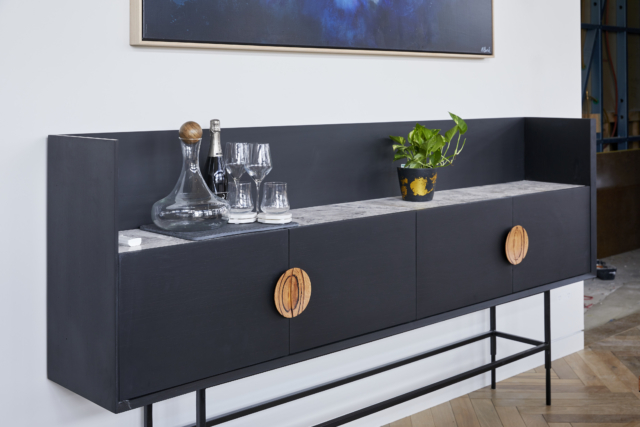 For Shaynna it was all about the Jessie Breakwell artwork – the highlight of the space for me too. 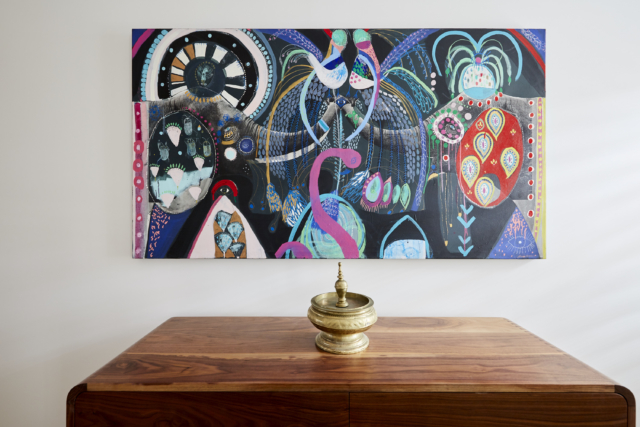 “The artwork is all personality,” said Shaynna. Neale felt the room had a sense of grandeur and personality and all of the judges were taken with the fully stocked, James Bond-inspired pop-up bar. 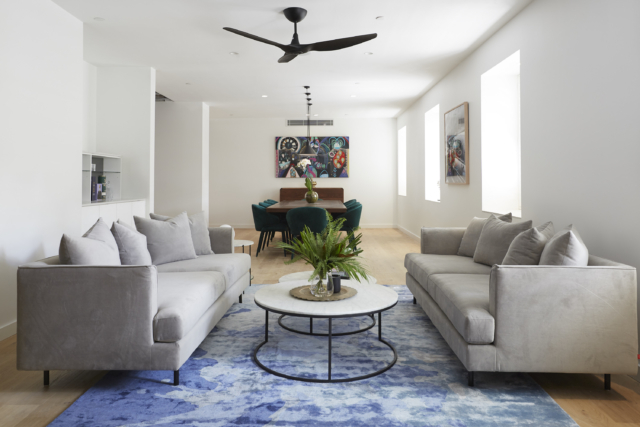 Shaynna complimented the lounge, said the coffee tables were a good size and thought the lounge area felt intimate despite the large space. “Courtney and Hans have gone from zero to hero this week. I thought this would break them but it didn’t!” said Neale. 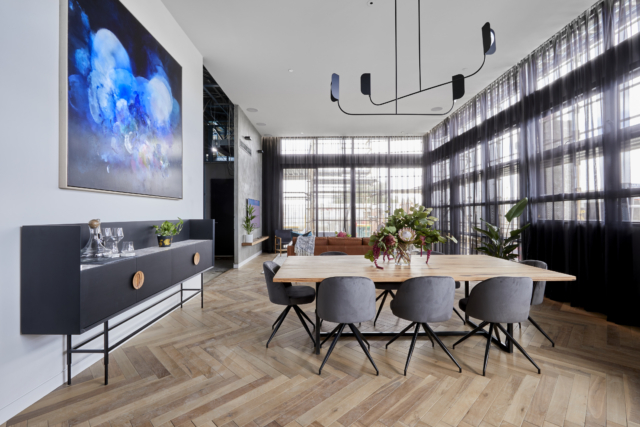 Neale loved the pendant light above the dining room table in particular but thought that the whole dining area was very beautiful. “I love the artwork and the cabinetry. 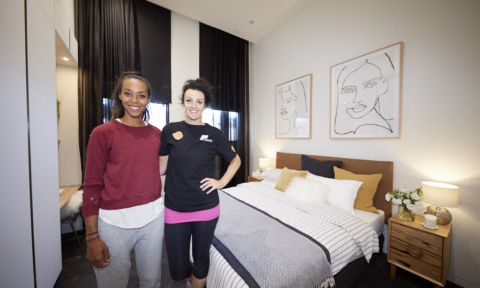 There’s a real sense of luxury,” said Neale and Shaynna agreed. 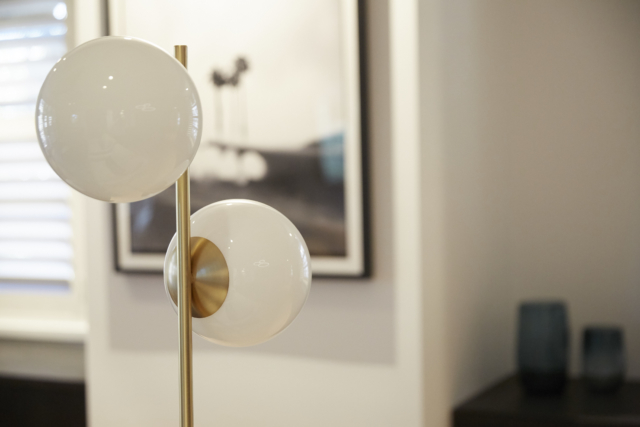 Darren praised the pair for their thoughtful design. 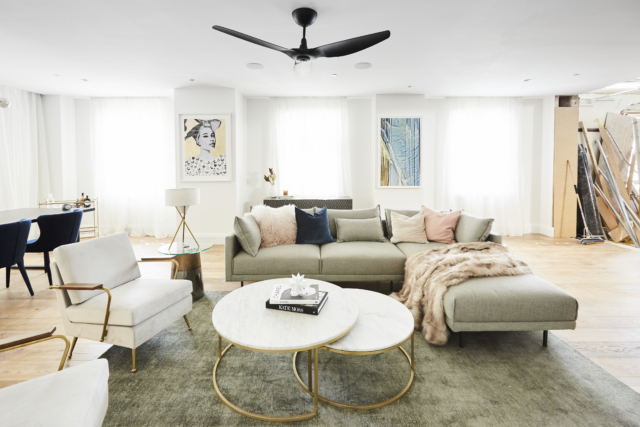 “The whole space is consistent because there are references back to different things across the whole apartment,” said Darren. The dining room chair legs echo the sideboard legs for instance. That Michael Bond artwork is perfect in the space. 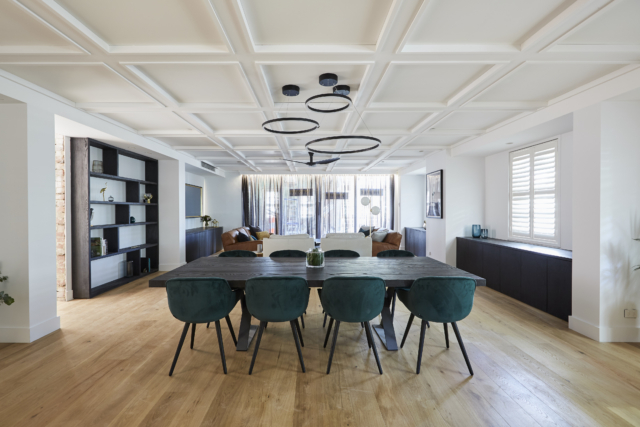 Sharing the joint third place spot with Jess and Norm, Kerrie and Spence pulled off a statement coffered ceiling. Shaynna liked the ceiling but questioned the couple’s choice of lighting. 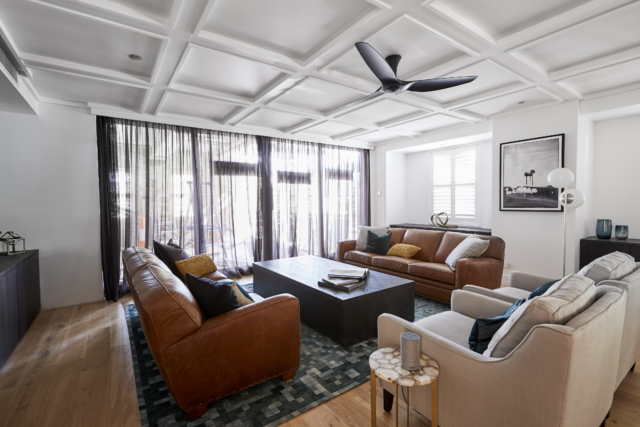 “The coffered ceiling gives an elegance to the room but why spend so much time creating a master craftsman ceiling if you’re just going to clutter it with feature lighting and a feature fan? 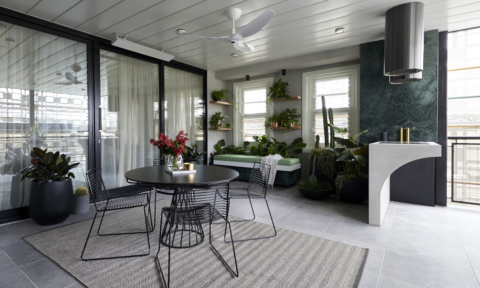 The ceiling needs to sing on its own and I’m not getting the breathing space that I need to appreciate its beauty,” said Shaynna. Shaynna wasn’t a fan of the room’s styling either. 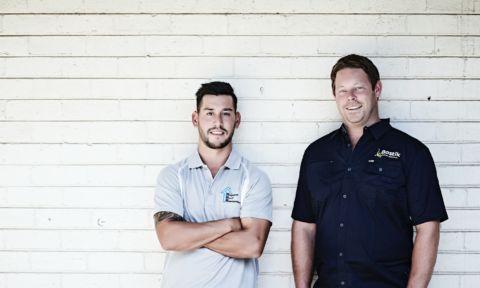 “It feels a bit nineties – it’s a little bit uptight and needs to loosen up. I feel like I’m in a nineties boardroom. 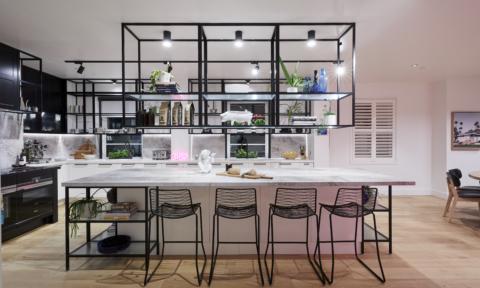 For this room to be perfect it needs an extra emotional layer,” added Shaynna. This room really divided the judges with Neale and Darren dishing out the compliments while Shaynna picked holes in the space. “The elephant in the room is the tonsil in the centre that’s not centred!” said Shaynna referring to the statement fireplace. 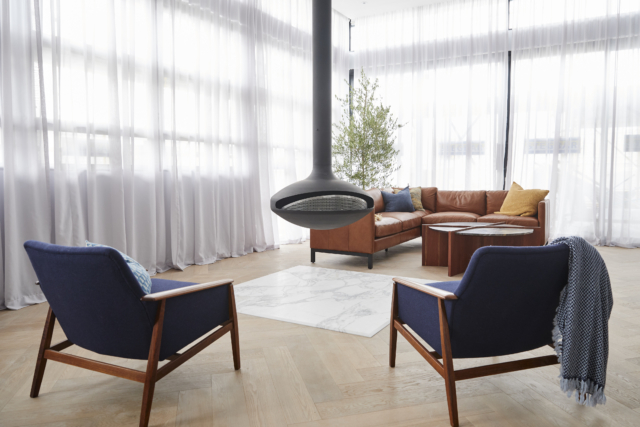 “That is a ridiculously expensive fireplace and its placement is possibly the worst I have ever seen,” said Shaynna. 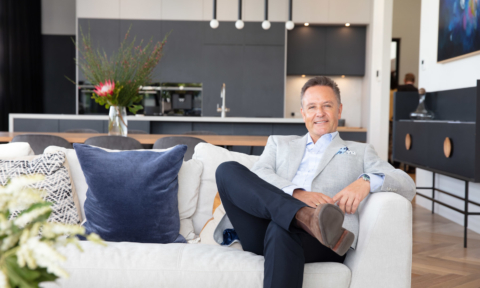 Darren defended the fireplace however and said that he liked the (legally required) marble underneath it while Shaynna most certainly did not. “I’m gobsmacked that you two think this room is amazing. 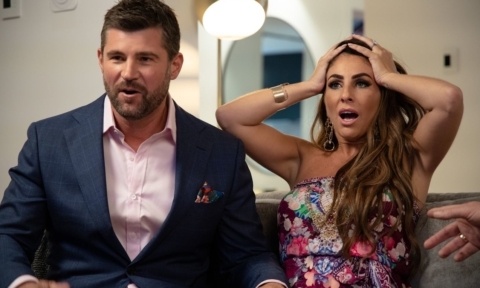 It’s polarising and could cost the couple at auction,” said Shaynna. Neale thought this pendant light was very dated. 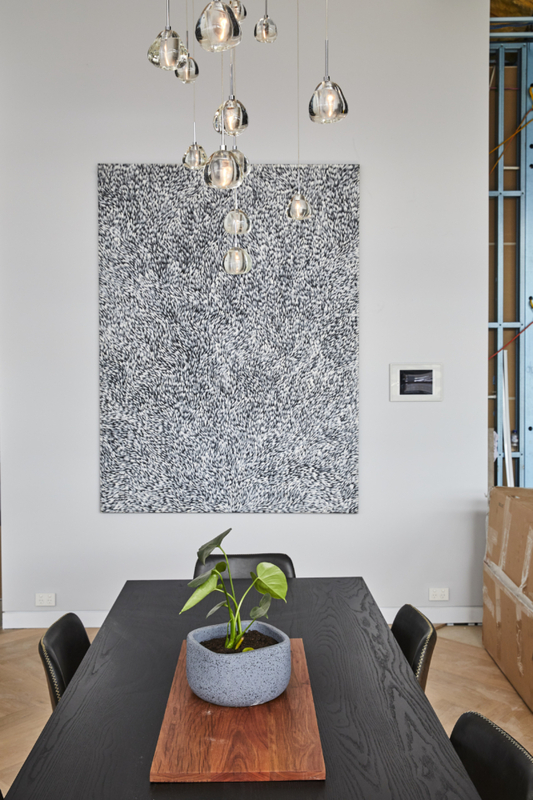 “It’s a visual cliche that is very out of step with the rest of the space,” he said. 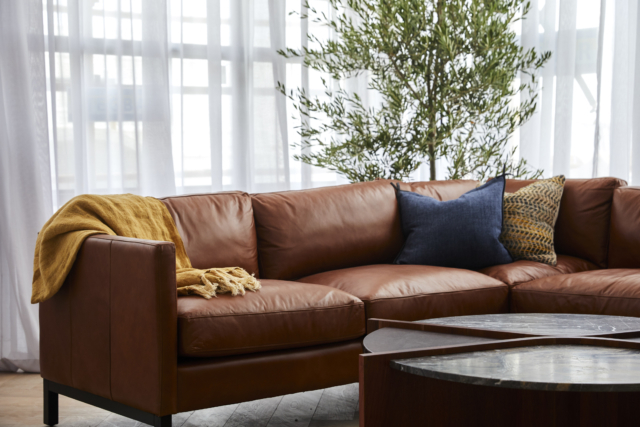 “I’m looking for a styling surprise, something that says ‘bespoke luxury’ and the room is all about the TV but I think it needs more than that. 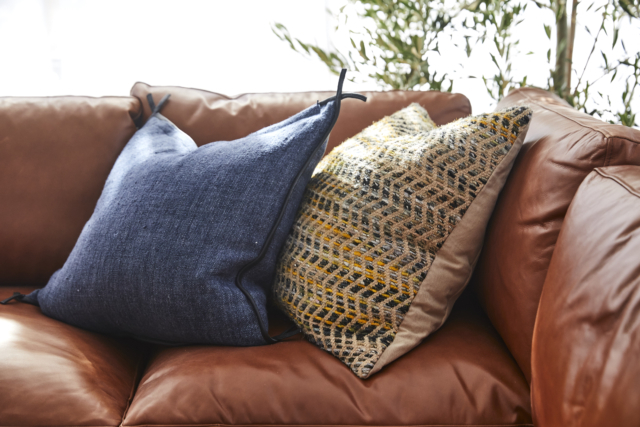 The styling looks like a collection of objects thrown together just to fill the space,” said Neale. “Both our books are there,” noted Darren as the judges left the space and he spotted his book and one of Shaynna’s. “Well they obviously didn’t open them!” said Shaynna in what was possibly the most cutting (but true!) moment of the episode. We’d love to know who YOU think should have won? the block is a styling competition! Very little creative thought. Certainly not much real Interior Design!